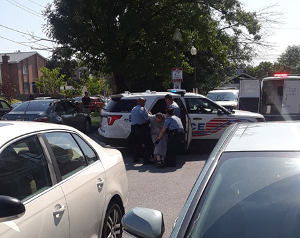 As Ireland Paves Way for Legalized Abortion, Babies Were Defended in Red Rose Rescue Saturday, March 26th in Washington, D. C.
AND ALL CHARGES WERE DROPPED AGAINST THE RED ROSE RESCUERS! By now most, if not all those who receive CPLS memos know the tragic news—that on March 25th Ireland voted 66 percent to revoke that country’s 8th Amendment—opening the passageway of death to legalize abortion on the Emerald Isle. 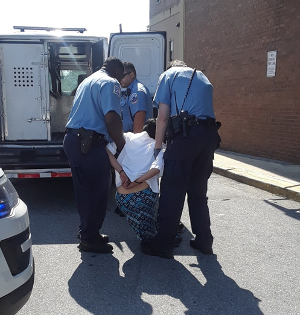 While the votes were still being counted on Saturday May 26th a Red Rose Rescue took place at the Capital Women’s Services abortion center on Georgia Ave NW in Washington, D. C.
Photo: “Baby Jane Doe” arrested when defending the unborn in March 26, 2018 Red Rose Rescue. At 9:00am, four pro-lifers carrying red roses entered the abortion facility where a packed waiting room awaited them. Twelve women were already seated there scheduled for abortions. The pro-lifers, namely Father Fidelis Moscinski of the Franciscan Friars of the Renewal, 26-year-old Lauren Handy, Adele Gillhooly and Immolatia Hernandez talked to the mothers scheduled for abortion, handed out literature, and offered red roses to everyone. A few women did take the roses and the literature. One woman named Esperanza left the clinic after Immolatia counseled her. Esperanza came down into the parking lot and was counseled again by sidewalk counselor and Red Rose Rescue supporter Bonnie Borel. When the police commenced the arrests of three of the rescuers a couple came to the door of the clinic. The officers would not allow them to enter, but Fr. Moscinski saw the man and the woman at the open door and was able to give them a rose. The man took the rose and the couple left! Another woman was at the abortion center accompanied by her father. Lauren Handy heard the woman say to her father: “I want to leave”—and Handy saw her in the the process of getting a refund at the reception counter. When the police eventually arrived, the entire building was partitioned off by yellow police tape. For a full 45 minutes anyone coming to the abortion center was not allowed to enter! 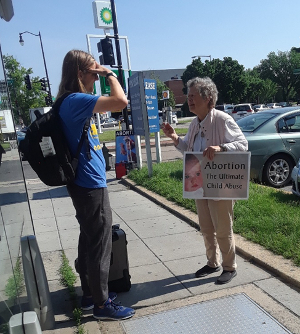 Because of the rescue in progress upstairs, the pro-lifers outside of the building that houses the abortion center had more time to speak to the women coming to the clinic. Photo: Fr. Moscinski arrested when defending the unborn from abortion. The rescue lasted a full two hours—that means that for a full 2 hours the killing business was at least delayed, mothers were given a witness to the sanctity of life within their wombs, offered help to turn away from abortion and the babies were defended. At just past 11:00am Fr. Moscinski, Lauren handy and Immolatia Hernandez were placed under arrest. Adele Gillhooly opted to leave the clinic after her third police warning. Adele’s time inside the clinic was extended beyond the others as the police were not able to immediately identify her as a pro-life rescuer. Photo: Joan McKee witnesses to a passerby on the street during the Red Rose Rescue. Joan was arrested defending the unborn in the first two Red Rose Rescues. And Get THIS!! Unprecedented in the History of the Pro-life Movement—the Trespass Charges Have Been Dropped! You heard that right! Here’s what happened and here’s the incredible explanation. Lauren Handy was released from jail on Saturday, May 26th and was told her charges were being dropped. She exited the precinct station a completely free woman. Fr. Stephen Imbarrato of Priests for Life was told by one of the officers handling the booking of the pro-life prisoners the following explanation: Last week a man who was in possession of an illegal hand gun used the gun to shoot a dog who was mauling a child, thus saving the child from serious injury, possibly even death. Under the circumstances the police opted not to charge the man with the illegal hand gun possession. 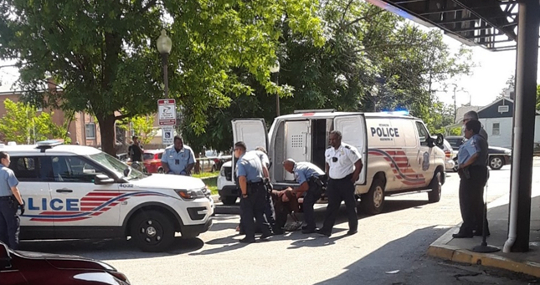 Apparently the D.C. officers, and no doubt at the direction of the D.C. district attorney, made a decision to treat the Red Rose Rescuers in the same way. In other words, technically they may have “violated” the law, but since they were attempting to save lives, the Red Rose Rescuers are NOT charged with any crime! This means that in a sense, the defense of necessity was applied BEFORE going to court!! I cannot over-emphasize how huge this is!! That charges would be dropped against pro-life rescuers FOR THIS REASON is unprecedented! 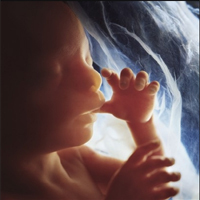 It means that the lives of the unborn have been at least tacitly RECOGNIZED by the legal system! The charge of trespass has not yet been dropped for Fr. Fidelis—but it will be once he attends his arraignment! And here is another important aspect of this whole amazing story. Immolatia Hernandez opted not to give her name to the police when she was arrested. She identified herself as “Baby Jane Doe” and engaged in peaceful non-cooperation with her captors so as to be in solidarity with the unwanted unborn. Yet, even she was released and charges dropped against her! We will keep you posted on all future developments! And what can we make of Ireland? THERE ARE REALLY NO WORDS IN ANY HUMAN LANGUAGE TO DESCRIBE WHAT HAPPENED TO IRELAND ON MARCH 25TH. WHY DID THE COUNTRY OF ST. PATRICK EMBRACE— INDEED SEEMS TO HAVE RUN HEAD LONG— INTO THE ARMS OF LEGALIZED ABORTION? Words such as horrific, tragic, despicable, deplorable, atrocious don’t even come close! That such a country could embrace the killing of the innocent is heart-breaking. No doubt there are sociological reasons for what happened—but in the end there is only one reason—and it is that the Irish have lost their fear of God. That is THE explanation. This country seems poised to mimic the rest of pro-death Europe and North America. Photo: The young in Ireland rejoice for abortion. 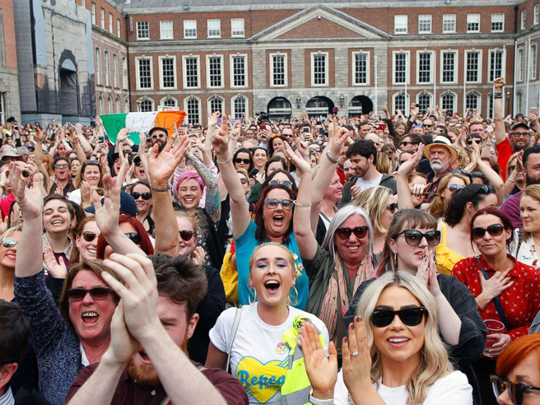 It is incredibly sad to see the photos of swarms of young people rejoicing in the streets that the “Yes” vote on the revocation of the 8th Amendment prevailed! Do they really know what it is they celebrate? Here is what will happen to Ireland. The bodies of the crushed unborn will be dumped in their landfills, Irish sewer lines will run red with the blood and the broken body parts of the unborn killed in the soon to be erected Irish abortion mills, incinerator pipes will belch out the smoke of the murdered unborn. That is what they celebrate, a country whose land and heart will be polluted by the killing of the innocent—not to mention the increase of Irish women who will be wounded by the killing acts! Those Irish who voted “Yes” believe that the revocation of the 8th Amendment is an act of compassion for women—as the Irish ban on abortion has forced Irish women who seek abortion to travel to other countries to kill their babies. There seems not to be any idea that killing the unborn has NOTHING to do with compassion. All this talk of “compassion” for women is nothing more than political rhetoric to advance abortion. One big reason that the “Yes” vote prevailed it is largely due to the fact the abortion forces in Ireland won the verbal war—seized language and imagery of beleaguered women who now can achieve their so-called liberation on the backs of their unwanted children! Here is what we need to do-- keep working, keep sacrificing, keep praying to end abortion. YES, one day this great injustice will end! And if you want to join the next Red Rose Rescue--if you are interested in defending the unborn in this way—going into what Mother Teresa called “the dark holes of the poor” to be the light of truth and light—all you need do is respond to this email and we will get back with you! Let us work and pray to end abortion.